Today is the election for the next Mayor of New York City. Mike Bloomberg cannot stand for a third term, and there are more than a dozen challengers competing to take his place. Whoever wins, I hope they support the great work that Mike Flowers, Chris Corcoran, Nick O’Brien and their data analytics team have been doing to join up information across the city to improve the way that the city fights fires, reduces crime, and administers child support payments. I met them last week, having already heard about the work that they had been doing to use data to clean up New York and predictive analytics to save lives. I wanted to hear more about the systems that supported these results, and to see what we could learn from them as we develop the performance pages of GOV.UK. I was intrigued to discover that they have a small team, using old technology, and a lot of manual wrangling. No pretty dashboards here. Most of their time is spent acquiring the data and then cleaning it. They have built strong relationships with other agencies across the city by demonstrating how their data can be used by others, and how others data can help them to make their own operations more effective. A map of agencies and data sources collected by New York's data analytics team. Click image to see a larger version. 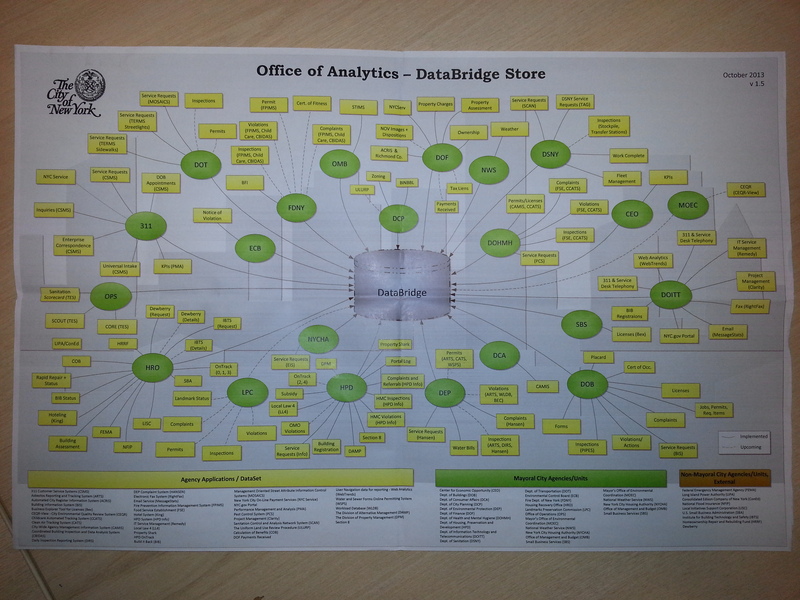 The picture above shows the map of agencies and data sources - a treasure trove of actionable information that goes well beyond the web analytics and social media sources that are the easiest to collect. And they take great care to respect the sensitivity of the data that they collect; the team often can’t see the raw data concerning individual citizen transactions, just the results from the aggregated analysis. In a city with 240,000 public employees, they have fewer than a dozen data scientists and a handful of other analysts. Nevertheless, while lots of people are talking about data analytics and its potential to change the way that government is run. Mike Flowers, Chris Corcoran, Nick O’Brien and the team are walking the talk. I hope the new Mayor continues to sponsor first class data driven decision making in New York City. improved digital service will support in the best way the new mayor's decision process..! I couldn´t agree more with this post. I´ve been following the work of NYC Digital Team and it´s awesome, I would like to add to the list Rachel Sterne, who´s been promoting the values and importance of improving digital services.